Peter E. Randall Publisher, 9781942155027, 352pp. Drawing on accounts from over a dozen witnesses, most never before published, the author recounts the life and death of one village. He follows his father, Boghos Kezerian Kaloosdian, and other townspeople from the first intimations of violence through deportations, separations, massacres, and escapes, to the establishment of diasporal communities. 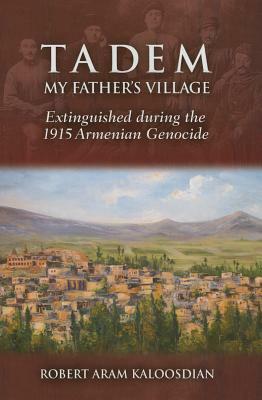 With striking immediacy, the author presents Tadem as a microcosm of the Genocide and argues that the Turks used the outbreak of World War I as a cover for atrocities motivated by religious hatred and greed. The son of a Genocide survivor, ROBERT ARAM KALOOSDIAN was raised in Watertown, Massachusetts, and graduated from Clark University and the Boston University School of Law. As a leader in Armenian-community affairs, Kaloosdian has devoted much of his life to the recognition and study of the Genocide. He was founding chairman of the Armenian National Institute and a founder of the Armenian Assembly of America. A lawyer for more than fifty years in Greater Boston, he aided the team defending a school curriculum guide against Genocide deniers in federal court. Kaloosdian practices in Watertown and lives in Belmont, Massachusetts, with his wife, Marianne.